Great history indicating in this post about the baluchari designer sarees. I like their production system which they were sharing in this post. Its good thinking to share knowledge with people. 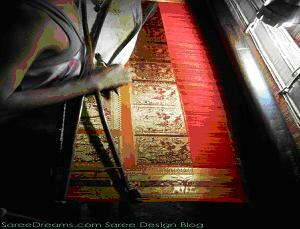 If you want to know about various type of sarees then Click Here…. 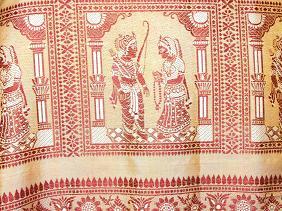 this particular art is gradually fading away due to poor payment to the weavers. this is an art that is not found anywhere in India along with the rich quality of silk….the hues and the shine of this particular silk is unbeatable. It is also uncomparable with the other varieties of silk found in India. Due to lack of marketing and letting people know about this art and silk, it is slowly coming to an untimely death. The motifs that are woven and the whole concept of this lovely saree is not being bought to the limelight properly. I had bought a Baluchari saree way back in 1990 for just Rs. 1800/- It still retains the shine the way I bought it years back. Now, that my daughter is getting married, I wish to gift Baluchari sarees to the ladies of her ” sasural” who are Mahrashtrians. In this era of designer sarees, I wish to show them the exquisite art of Bengal on sarees & the rare talent of our craftsmen. We request all baluchari lovers to help promote this dying craft. This is a good illustrative presentation of the background of baluchari sarees, and a great initiative of Silk Mark to promote the rich heritage of Bengal. I would like to add that this artistic tradition is once again seeing a revival today due to the proliferation of the online medium of distribution by various e-portals and e-commerce sites. 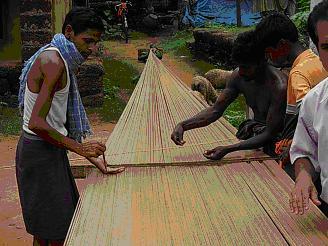 This is helping to take these sarees out of their traditional home of Bengal to the rest of India and the world.